Paul said in 2 Timothy 4:7-8a: “I have fought the good fight, I have finished the race, I have kept the faith. Now there is in store for me the crown of righteousness, which the Lord, the righteous Judge, will award top me on that day.” In these verses Paul is saying, as a victor in life in Jesus, that life is a continuous battle, and that there is a victor and a looser. But by the grace of God we can taste victory in Jesus. Today’s passage is about David and Goliath. David was the youngest of the eight sons of Jesse, and he was a teenage shepherd. He fought a duel, against Goliath, a giant of a man, and won the victory over this champion. There are many accounts of faith in the Bible that inspire us to overcome fear and to be filled with faith to meet our daily challenges. But in the Bible, this account of young David is one of the most beautiful and powerful because it teaches us that indeed “faith is the victory we know that overcomes the world.” (from the hymn, Faith is The Victory). Like David, we also must fight many good fights during our lifetimes. I am certain that if we learn to see every “Goliath” through eyes of faith – we would conquer all our fears; and what is more – put our fears to death and walk victoriously in the faith. Let’s see. There was a war between the Philistines and the Israelites. The Philistines were an idol worshipping people at war with the people of Israel. The Philistines were the enemies of God’s people, bent on destroying them. From the Philistines aggression, we can learn how Satan fights against God’s people and what strategy he uses in his attempts at conquering them. In those days, warfare began with a face to face confrontation. In a battle, the spirit of an army was the most important factor in procuring victory, and the spirit of an army largely depended on its leader. Now the Philistines gathered their forces for war and assembled at Socoh in Judah. They pitched camps at Ephes Dammin between Socoh and Azekah. Saul and his Israelites assembled and camped in the Valley of Elah and drew up their battle line to meet the Philistines. The Philistines occupied one hill and the Israelites another, with the valley between them. Nobody wanted to attack the other, because the army that did would have to face an upward battle to reach the opposing army. And so they stood where they were, making no headway. A champion named Goliath, who was from Gath, came out of the Philistine camp. He was over nine feet tall. Yao Ming, the Chinese Basketball star, in 2009, is 7’6” and weighs about 300lbs. Leonid Stadnick of Ukraine is 8’5” and weighs over 440lbs. Still growing he refuses to get measured. Due to his weight he broke a leg and has constant knee pain. Maybe Goliath had constant knee pain. He had a bronze helmet on his head and wore a coat of scale armor made of bronze weighing 125 pounds. On his legs he wore bronze greaves and a bronze javelin was slung on his back. His spear was a like a weaver’s rod, and its iron point weighed 15 pounds. It was like having a two by four piece of wood with a large turkey at the end of it. It could have pierced a car door. Goliath was a champion who was strong, experienced in war, disciplined and well equipped with arms. He became a great champion by defeating innumerable opponents through vicious fighting and bloodshed. There was no soldier as fierce as Goliath. He had never been defeated as a champion. Even today, his name, “Goliath” carries with it connotations of fear and terror. Challenge and response – this was the way the people fought in ancient times. Goliath began to use psychological tactics against God’s people. He stood and shouted to the ranks of Israel, “Choose a man and have him come down to me. 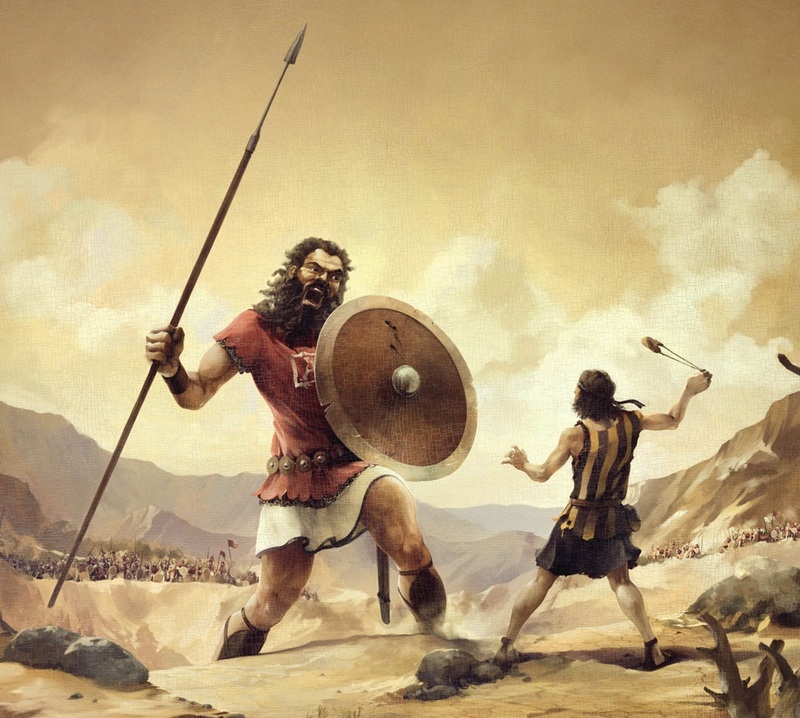 If he is able to fight and kill me, we will become our subjects; but if I overcome him and kill him, you will become our subjects and serve us.” (8b,9) Goliath challenged the ranks of Israel to send a worthy opponent to fight a duel so as to decide which side should be subject to the other. The army, whose champion lost, would be subject to the victor’s army. Israel did not dare to respond to the challenge. On hearing Goliath’s words, Saul and his army were dismayed and terrified. The definition of dismayed is, “To disable with alarm…to depress the spirits of or courage of.” (Webster’s Collegiate Dictionary, 1945) They were paralyzed by fear. This terrifying challenge did not stop after one incident. For forty days Goliath came forward every morning and evening, took his stand and shouted, saying, “This day I defy the ranks of Israel! Give me a man and let us fight each other.” (10) Day after day, the hearts of the Israelites were filled with fear and terror. They were paralyzed. They were no more the armies of the living God. Practically speaking, they were the slaves of fear and the devil. Goliath’s strategy in warfare was to plant fear in the hearts of his opponents by intimidating them with his loud, angry cries. In doing this, he won the victory over the Israelites without even fighting. The Israelites lost the war before the fight because of their fear. In reality, the enemy of the Israelites was not Goliath, the champion. Their real enemy was the fear in their hearts. Franklin D. Roosevelt once said in 1933, “There is nothing to fear but fear itself.” He was speaking about the difficult economic situation of the 1930’s. That was America’s “Goliath.” But the principle remains the same…if a person wants to have a victorious life, they must make up their mind to overcome the fear of their “Goliaths” through faith in God, otherwise their lives will be continuous waves of defeat, trembling in fear. Let’s learn how to win victory over Goliath from young David. David was the youngest among the eight sons of Jesse. He was also a shepherd and stayed home when his brothers were drafted by Saul. One day, David was sent to the front lines by his father to deliver food to his brothers and 10 cheese packages to the commander. When he arrived, the armies were drawn up in battle positions. David greeted his brothers, and as they stood there talking, Goliath came out to shout his usual defiant insults. Saul and all the Israelites were once again dismayed and terrified. First, David had a spirit of victory. Even though David was young, he loved God and he was full of holy anger at the Lord’s enemies. He said, “Who is this uncircumcised Philistine that he should defy the armies of the living God?” (26) To David, who had faith in God Almighty, Goliath looked as if he were nothing. David saw Goliath not as a living adversary but as a defeated foe, as if he was a mosquito, noisy and irritating. On the other hand, he saw the armies of the living God as all powerful. David was indeed full of a spirit of victory that conquers all God’s enemies. When Eliab, David’s oldest brother, heard him say this, he could not understand David and got mad. He said, “I know how conceited you and how wicked your heart is.” (28b) Maybe Eliab thought he should have been anointed by Samuel, instead of David. Second, David had faith that takes initiative. When he was sent to Saul, David said to him, “Let no one loose heart on account of this Philistine; your servant will go and fight him.” (32) David was determined to fight this Goliath, and he took the initiative to start the fight. David’s first reaction was not to cower or let someone else fight the battle. His first reaction was to fight against this enemy of God himself. David had initiative to challenge all God’s enemies and subdue them. His words in verse 32, “I’ll do it,” tell us that he was always ready to serve God’s purpose in his life. He was always ready to be the first to do what is necessary to bring glory God. He could take such initiative because of his faith in God. How comforting this young man must have been to Saul. There are times when God calls us to take the initiative in things and not wait for others. When we do, we are well on the way to tasting spiritual victory, like David. Third, David had faith in God’s deliverance. Saul saw David and said, “You are only a boy.” (33) He meant, “Your spirit is good, but you are too young to fight Goliath.” At this point, David, in order to convince him, gave him an overview of his life as a shepherd. Read verses 34-37a, “But David said to Saul, ‘Your servant has been keeping his father’s sheep. When a lion or bear came and carried off a sheep from the flock I went after it, struck it and rescued the sheep from its mouth. When it turned on me, I seized it by its hair, struck it and liked it. Your servant has killed both the lion and the bear; this uncircumcised Philistine will be like one of them, because he has defied the armies of the living God. The Lord has delivered me from the paw of the lion and the paw of the bear will deliver me from the hand of this Philistine.” In these verses, we learn two things from David. First, he talked about how courageous he had been. He mentioned dangerous wild animals who had attacked his flock and how he had fought them, risking his life. But he did not claim the glory for himself. He confessed that it was God who delivered him from danger. He knew that it was a dangerous and fearful thing to fight Goliath, but he was sure that the Lord, who had delivered him from the paw of the lion and the paw of the bear would deliver him from the hand of the Philistine. (37) This was faith in God’s deliverance. By faith in God, he overcame his fear and he could boldly respond to the challenge of Goliath, stand firmly and fight. If we are going to have faith in God’s deliverance, we need to experience God’s deliverance. That is only possible when, in difficult situations, you step out in faith and obey what God wants you to do. Then, when God delivers you, you have a spiritual experience. You can draw upon this experience again and again, throughout your lifetime, to meet future challenges by faith. Don’t let your life go by without experiencing God’s deliverance, as you follow his will. Saul’s heart was moved by David’s courage. He said to David, “Go, and the Lord will be with you.” (37b) In a helpless situation, King Saul could not but depend on David who had faith in God Almighty. A teenager with faith is more powerful than a king at times. What did David do in order to prepare to fight Goliath? At first, he tried on Saul’s armor, but he took it off because he was not used to it. Then he took his staff in his hand, chose five smooth stones from the stream, put them in the pouch of his shepherd’s bag and, with his sling in his hand, approached the Philistine. Meanwhile, the Philistine looked David over and saw that he was a boy, ruddy and handsome, and he despised him. Jokingly he said to David, “Am I a dog that you come to me with sticks.” He was overconfident about his skill. He never expected anything unusual to happen. He was boastful, proud and foolish and on the road to a humiliating defeat. Fourth, David had faith that honors God’s name. Look at verses 45-46, “David said to the Philistine, ‘You come against me with sword and spear and javelin, but I come against you in the name of the LORD Almighty, the God of the armies of Israel, whom you have defied. 46 This day the LORD will hand you over to me, and I’ll strike you down and cut off your head. Today I will give the carcasses of the Philistine army to the birds of the air and the beasts of the earth, and the whole world will know that there is a God in Israel.’” This is David’s confession of faith. He said, “…I come against you in the name of the LORD Almighty, the God of the armies of Israel…” David should fear this giant. But he could overcome his fear when he faced him with the faith that he was fighting him in the name of the Lord Almighty. He had faith that he was God’s ambassador with all the power and authority of God to conquer the enemy in the name of the Lord, for the honor of God. Indeed, this kind of faith overcomes fears and conquers spiritual enemies within our hearts. Fifth, David had faith that the battle is the Lord’s. Read verse 47 again. David had faith in God to fight this Goliath. As a loyal soldier in the Lord’s army, he had a duty to fight Goliath in order to honor and glorify the Almighty God. There was no choice to fight. It was his duty. But he was filled with faith and his faith came from a conviction that this battle, and all battles for that matter, are the Lord’s battles and therefore, they must surely trust God. With this faith then, he overcame all his fear and the victory was assured. What was the result? As the Philistine moved closer to attack him, David ran quickly, with total concentration, toward the battle line to meet him. Reaching into his bag, he took out a stone and slung it and struck the Philistine on the forehead. The stone sank into his forehead, and he fell facedown into the ground. David ran and stood over him. He took hold of the Philistine’s sword and drew it from the scabbard. After he had killed him, he cut off his head with the sword. David triumphed over the Philistine. The secret of his victory lay in his faith in God Almighty. He was a young man, but he had no fear in his heart, and God granted him victory. What was the outcome? Look at verses 50-58. Let’s read verses 51b-53. “ When the Philistines saw that their hero was dead, they turned and ran. 52 Then the men of Israel and Judah surged forward with a shout and pursued the Philistines to the entrance of Gath and to the gates of Ekron. Their dead were strewn along the Shaaraim road to Gath and Ekron. 53 When the Israelites returned from chasing the Philistines, they plundered their camp.” David’s courageous faith encouraged everyone around him. It made all the difference. For 40 days things were at a standstill. And all at once the army was emboldened. Here we see the power of one. It takes the faith of one person, possessing the spirit of God in their hearts, to enliven the hearts of all God’s people. There are many kinds of Goliath’s in the world that make us fearful. Living in this age of high technology we still have many fears, fears of cancer, pollution of nature, population explosion, global warming, economic collapse, terrorism. Perhaps the fear of future insecurities is most terrifying for some. Fear is the gift of Satan given to people until they do nothing except trying to assuage their fears, turning away from God. Because of the Goliaths of this world, people tremble in fear day and night. What can people do about their fears except to give up? In fear, they lose the spiritual battle. Indeed, fear is our enemy. What is the root of fear? It has been said that they opposite of faith is fear. The opposite of faith is also unbelief. It is unbelief, which causes a severed relationship with God. Let’s remember Genesis. Cain rejected God’s counsel; thinking that he would be free if he lived in his own way. But this was not so. He was overcome by fear. At the moment he ran away from God, he confessed, “My punishment is more than I can bear…whoever finds me will kill me.” (Gen 4:13-14) There are many descendants of Cain in this world. They don’t know why they tremble in fear day and night. Why are people so fearful? Fear does not come from without, but from within. Paul explains in Romans 8:15, “For you did not receive a spirit that makes you a slave again to fear, but you received a Spirit of sonship. And by him we cry, ‘Abba, Father.’” It is a spirit within a man that makes him a slave to fear. When a person’s intimate relationship with God is broken, evil spirits try to occupy their heart and make them fearful. They are miserable most of the time because of fear. Such is a life outside of Christ. Let’s think of an example from the New Testament. Paul’s disciple, the gentle and quiet Timothy, was in Paul’s eyes the right person to serve God’s flock. Indeed, Timothy had many godly qualities. He was honest, faithful and sincere. But Timothy had a problem believing that he was the right one to serve God’s purpose. From time to time, he was harassed by the “Goliath” of leadership responsibilities. Every time he decided to do something for the glory of God or the good of others or the church, suddenly this Goliath appeared and intimidated him to give up. Goliath said to him, “No one respects you as a leader. You have no leadership qualities.” Timothy struggled a lot with this Goliath. But he overcame his fears through the godly advice give by Paul in 2 Timothy 1:17, “For God did not give us a spirit of timidity, but a spirit of power, of love and of self-discipline.” Satan gives us the spirit of fear (timidity) when we have to go beyond our comfort zone to do something beyond our ability. But we must listen to God who gives us a spirit of power, of love and of self-discipline. The Spirit of God enables us to overcome all fears. Through this passage we see that unbelief is the cause of fear and defeat, and that faith is the secret of victory. When we depend on our strength and skill, we loose our battles. But when we depend on God, to overcome our fear and fight, surely victory will be ours, even though we may be young. May God give us a victorious spirit and a victorious life when we determine to have faith in God in the face of our many “Goliaths” and stand and fight by faith. How did Goliath look at David? (41-42) With what kind of words did he curse David? together? (45) Who is the God whom David depended on? that we are engaged in a spiritual battle and how can we taste God’s victory in this battle? « The Characteristics of Life in Franklin County NY in the early 1800’s, (inland from the St Lawrence River).